This program is an innovative approach that combines the latest in medical research about pelvic floor function, with the Feldenkrais Method of Somatic Education. Pelvic Health and Awareness for Women and Men is a step by step program to improve your awareness and function of the pelvic floor. Developed by Deborah Bowes, PT, these gentle exercises in this program go beyond any existing pelvic floor training program. The exercises are effective for improving bladder control, reducing back or pelvic pain, and recovering from childbirth, abdominal or prostate surgery or trauma. They are also useful for sexual functioning, digestive troubles and hip problems. Equestrians, dancers and movement teachers will find immediate application in their own field. The exercises in the Pelvic Health and Awareness program, supported by the research, emphasize the use of the pelvic floor muscles with other muscles in the hips, legs, and torso, as part of a coordinated system. The lessons use larger functional movements, breathing, imagery and directed attention to improve awareness and control of the pelvic floor. The audio program includes everything you need to know in order to benefit. When you have completed the program, you will have more awareness and control of the pelvic floor. The lessons have easy to follow instructions for what to do, how to do it, and where to direct your attention. There are six educational talks and six easy to do Awareness Through Movement lessons. Lessons 1-4 are done lying on a firmly padded surface, like a carpet, exercise mat or folded blanket, and lesson 5-6 explore using the pelvic floor as you sit and move on a firm chair. These novel and gentle exercises are easy to do and appropriate for all adults. You don't need any special equipment, just your CD player and thirty minutes a day to see steady improvement. 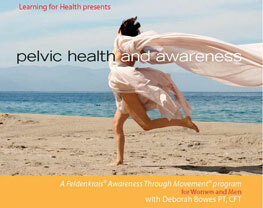 Click on the link for an article by Deborah Bowes on pelvic floor health. 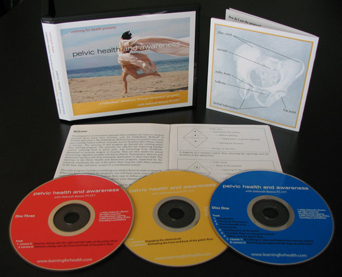 Click on the link for information about upcoming Pelvic Health and Awareness workshops for the public and professional training with Deborah Bowes. Click on the link to read about our other CD programs for pain, repetitive strain injuries and more. Click on the link to read our articles about chronic pain, repetitive strain injuries and more.